The problem with all things marketing (to the non-marketing person) is that much of it seems either mysterious or frankly, just made up. You only have to watch someone’s eyes glaze over when you mention SEO or branding to know that they’ve zoned out and gone to their happy place, where marketing jargon doesn’t interfere with their daily business. Public relations is no different. In fact, if you ask most people how they define public relations, the answer would be hazy at best. That’s because most people don’t even realise that PR is a distinct and different branch of marketing altogether. Of course, it doesn’t help that even in the industry, those who do define public relations do so differently. Some differences are subtle, while others are not, but thank goodness there are at least a few common threads. Public Relations, like many areas of marketing communications, spans a fairly broad spectrum of tasks and activities, so it’s no surprise that most people have a slightly different definition of what it is, exactly. 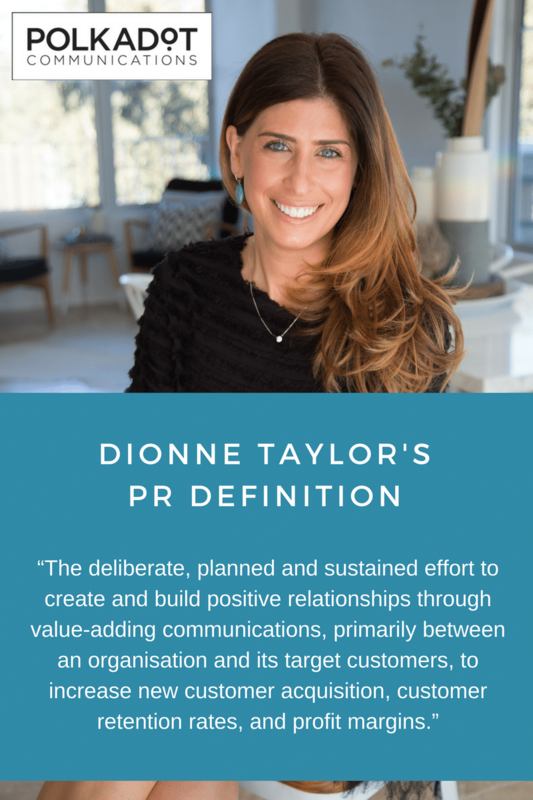 We’ve collected six definitions published by various international PR organisations and associations that all capture something special about this often misunderstood branch of marketing. Take a look and see what you think about them and then if you’re ready to grow your business with PR, check out our awesome PR Playbook for lots of great strategies, tactics and free tools! “The management function which evaluates public attitudes, identifies the policies and procedures of an individual or an organisation with the public interest, and plans and executes a programme of action to earn public understanding and acceptance.” Source: Public Relations News. Tuned out yet? Or do I still have your attention? ‘Organisation’ can be a government body, a business, a profession, a public service or a body concerned with health, culture, education – indeed any corporate or voluntary body large or small. ‘Publics’are audiences that are important to the organisation. They include customers – existing and potential; employees and management; investors; media; government; suppliers; opinion-formers. ‘Understanding’is a two-way process. To be effective, an organisation needs to listen to the opinions of those with whom it deals and not solely provide information. Issuing a barrage of propaganda is not enough in today’s open society. For more than a decade, we’ve worked with hundreds of businesses, predominantly as their PR agency. In this context, we can tell you this; while the definitions above are great for PR in general, they don’t really cut it when you’re on the front line. If we were to pitch our PR services using the above definitions, how many do you think we’d win? Because businesses typically use PR to support the sales process (and that includes retaining clients too). That’s not something that’s really mentioned above. This is, of course, a narrower definition than the ones above. But our clients want these results, we always deliver these results, and so we think it makes sense for a definition in a commercial context to be focussed on these results. More than any other branch of marketing and advertising, PR is focused on public opinion, and in guiding that public opinion into a space that is favourable to the company or client. In some cases, this happens on a routine basis, by informing and educating the marketplace about a company’s activities, philosophies and triumphs, but it’s even more critical when something has gone wrong, and the proverbial fat is already in the fire. PR practitioners and firms never work harder than when the damage is already done, and they need to put a positive spin on a potentially damaging situation. It may not always work immediately, but a good PR response can turn an all-out catastrophe into a neutral or even a positive experience. We create and mould public opinion. We change perceptions, and yes, sometimes, we have to clean up very big messes. Many people see PR as a reactionary process. When companies have made mistakes in judgement or famous people have hurt their reputations, they bring in their public relations specialist to smooth things over and get them back on an even keel. Good PR is not just something you do to fix a problem though. It’s a carefully planned and thought out series of events and communications that are designed to grow and enhance reputation. Done right, PR should be an ongoing process of intentional image management that encompasses a wide variety range of disciplines, including communications, marketing, press and other forms of publicity. Far from being a knee-jerk reaction, a good PR strategy is carefully thought out months in advance, reviewed frequently, and analysed for efficacy. Strategies are carefully created and rolled out, and results are measured and quantified. Changes are made as needed, and the ultimate goal is to build a rapport with the public that increases an organisation’s profitability and is able to withstand the occasional bump in the road. PR is not merely marketing with a fancy name. It’s more than just communications, and it goes far beyond advertising. It’s a highly specialised professional process that literally changes the way the world sees your company or brand. But don’t just take our word for it. After all, we may well be biased by our passion for the industry. Tell us what you believe PR is, how you define public relations, and what you’d like to see it do for you! Which of the definitions here is your favourite?